Read Fantasy Book Critic's review of "Grimoire Of The Lamb"
OFFICIAL BOOK BLURB: For a two-thousand-year-old Druid, Atticus O’Sullivan is a pretty fast runner. Good thing, because he’s being chased by not one but two goddesses of the hunt—Artemis and Diana—for messing with one of their own. Dodging their slings and arrows, Atticus, Granuaile, and his wolfhound Oberon are making a mad dash across modern-day Europe to seek help from a friend of the Tuatha Dé Danann. His usual magical option of shifting planes is blocked, so instead of playing hide-and-seek, the game plan is . . . run like hell. FORMAT/INFO: Hunted is 400 pages long divided over thirty numbered chapters and an epilogue. There’s also a pronunciation guide for all the names and phrases mentioned in the book, an author’s note as well as the Iron Druid Chronicles novella Two Ravens And One Crow. Narration is in the first-person, via Atticus O’Sullivan and Granuaile MacTiernan. 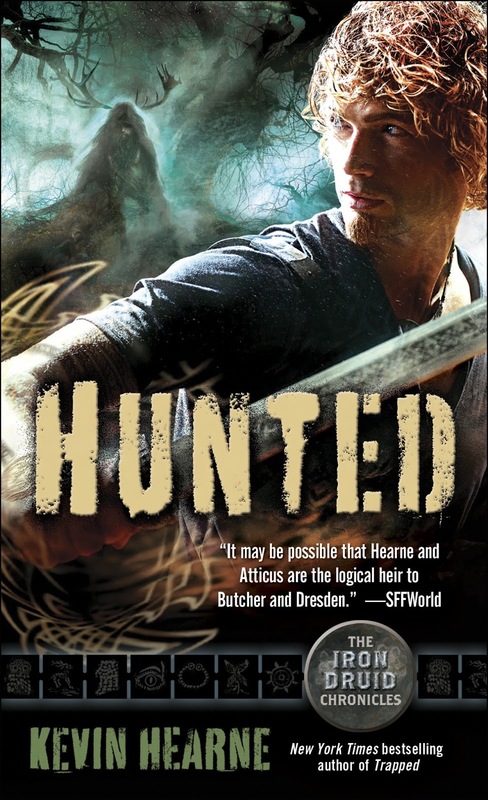 Hunted is the sixth Iron Druid Chronicle and it would be extremely ill advised to jump into the series with this book as the plot has a ton of references to the many events and characters in the preceding books. June 25, 2013 marked the North American Mass Market Paperback publication of Hunted via Del Rey books. Cover art is provided by Gene Mollica. ANALYSIS (Mihir): Hunted is the sixth volume of the Iron Druid Chronicles and now the readers are firmly in the middle of this fascinating saga. When we last left Atticus, Granuaile and Oberon, they were just about running from certain doom in the form of two huntresses that were facsimiles of each other across languages and cultures. Hunted opens up with a very tense situation wherein our favorite two Iron druids and their dog are running across planes while the Morrigan is trying to buy them time. The Greek and Roman pantheons are pissed that Atticus has managed to trap Bacchus in a time trap of sorts. So Diana and Artemis have been sent to capture the recalcitrant druid and bring him to heel. What they don’t count upon is that Atticus has more than a few tricks up to his sleeve and he has a few gods across various pantheons on his side as well. Atticus also has Granuaile and Oberon with him across his trek across Europe and he will also come across previous enemies turned allies like the Polish witch coven and surprisingly an ally turned enemy that is Lief Helgarson. There are a lot more surprises in this book including a few deaths including the major characters and this was a major surprising move on the author’s part. Hunted is many ways a thriller of a book than just a regular urban fantasy book. What I really enjoyed about this book is that not only do we get Atticus in all his snarky glory but also Granuaile who gets to be a major POV character with this book. Previously she only had a POV in a short story but with this book due to certain events, it becomes highly imperative for readers to see what she thinks. Like I mentioned previously this book reads much more like a thriller and kudos to the author for structuring this book this way. Not only is the European trek across the mortal plane but also across the metaphysical one as Atticus and Granuaile are assailed on several fronts and don’t quite know what to do. The author also brings to the fore several storylines that have been fermenting across the last two books and a novella. This book also brings close to the arc begin from Hammered in the sense that Atticus’ meddling has changed the timeline and fortunes of all folks across all realms and pantheons. The events occurring in this book don’t necessarily close out the story but several storylines that had begun come to a close and we are given new story arcs that begin with this one and the next book Shattered becomes pertinent to the readers. I was very concerned about this book after the less than fun experience I had with its predecessor. This book does overcome the problems faced by Trapped but not the extent that I would have liked. The book very early kind of splits up into two plot threads and then continues before joining up again in the middle. This move along with the plot twists does help in making this book much more unpredictable than its predecessors. I've a similar complaint like my colleague Casey in regards to a certain plot twist that occurs in the start and then the author tries very hard to retroactively show how it all fit in the past. This wasn't really required as it felt a bit odd given the character’s actions in the past books. Overall I would easily rate this below the first three as that trio has set the bar really high for the sequel books and it remains to be seen how much the last three will adhere to the awesomeness of the first three books. On one hand, we get more interesting foes and mythologies, some new magic, Granuaile starting to come into her own, and Oberon, who is always delightful. On the other, once the main conflict of the book is dealt with, Atticus promptly ditches Granuaile and Oberon to try and deal with it on his own. The outcome of that doesn't really bother me, except that there's a whole lot of time spent in this book on action sequences with no particular bearing on character development. In this book, we also got chapters from Granuaile's perspective. Admittedly, I read the ARC, so this could have been smoothed out prior to publishing, but a lot of times her voice in each felt really stilted and overly formal. More to the point, while Atticus sounds like himself whether in dialogue or monologue, there was a sharp divide with Granuaile's, and also a divide between the tone of the rest of the book, which was really jarring to read. My biggest problem, though, has to do with a surprise death right towards the beginning. It came out of nowhere, and Atticus spent the rest of the book justifying how he should have seen it coming and retconning other readings onto past events. I'm not upset because it was my favorite character; I'm upset because the whole premise of the book is dependent on a death that was retroactively explained, the motivations told to me since they weren't evident in the text. There are times when an author pulls the wool over the readers' eyes so that when we figure it out, we exult in the trick; this felt like being cheated. My feelings on this installment are mixed. He set the bar really high with the early books in the series, and I don't think this one meets it. I love the series, and I still look forward to reading more and seeing where Hearne is going with this, but I've lost a bit of my trust. CONCLUSION (Mihir): Kevin Hearne’s Hunted is a good book and an even better urban fantasy thriller; it also showcases the end game that is developing. Kevin Hearne has long since grown out of Jim Butcher’s shadow to become a writer of his own slant in the urban fantasy genre. Hunted is another good example of action, comedy and mythology all conveniently rolled into a smooth package that has become ambrosia to Hearne’s ever-growing fan legions. A 'game changer' with the death at the beginning and another possible one, probably to a lesser extent with the introduction of a character important to Atticus early in his life. I enjoyed the action and pace, although a bit slow at times, seemingly off the track a bit. But my only real complaint is that the humor/comments of Oberon are a bit overdone at times. I enjoyed Hunted more than Trapped, about equal to Hammered, and less than Hexed, Tricked and Hounded. It was neat that the novella Two Ravens and One Crow was included in the print edition.